Moved over traditional scalloped potatoes, there’s a new side dish in town! 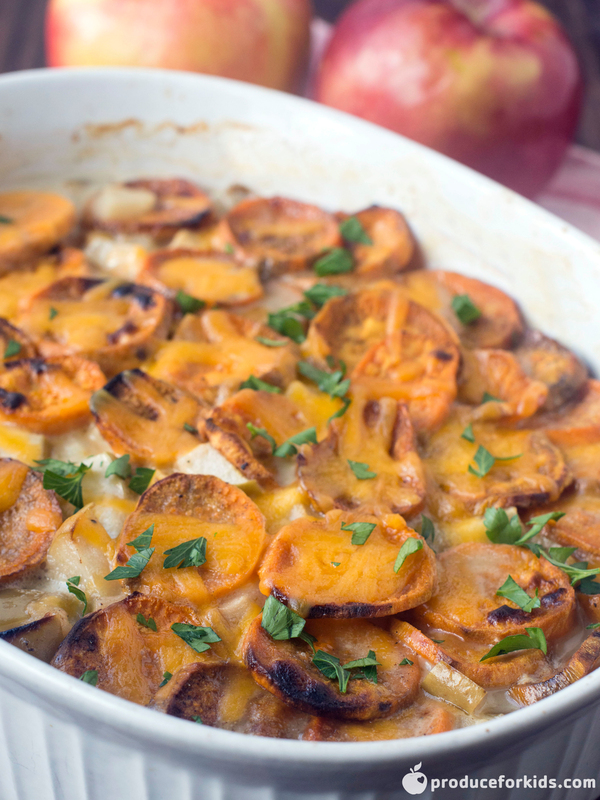 These Scalloped Sweet Potatoes with apples are the perfect combination of sweet and savory in one dish. Plus, everything bakes in one dish for easy prep and clean-up. No need to make a sauce in a skillet before baking! Preheat oven to 350F. Lightly grease a 13×9-inch baking dish. Toss sweet potatoes with salt, pepper, nutmeg and cinnamon in large bowl. In separate bowl, toss apples, onion, flour and lemon juice. Spread half of sweet potatoes in single layer in baking dish. Top with apples and onions. Arrange remaining sweet potatoes on top in overlapping pattern. Mix cream and stock. Pour over sweet potatoes. Cover with foil and bake 30 minutes. Increase heat to 425F and remove foil. Bake 20-25 minutes, or until tender and lightly browned on top.